Badminton is a fast paced sport that requires a lot movement in different directions. 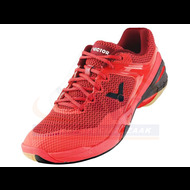 There are badminton shoes especially designed for the badminton sport or other quick response indoor sports. A thin but well-supported sole with good lateral support keeps the player's feet close to the ground. This makes it possible to make quick moves and minimal chance of injury. The shoes are made of lightweight materials for faster foot movement and the sole surface has an anti-slip layer with enough grip to respond quickly. As the price of the shoes increases, the applied technologies also apply.